In last week’s post, I focused on the scary & unnecessary ingredients present in most conventional Halloween candies sold this time of the year and marketed to children and their parents. Americans buy over 600 million pounds of candy in the week leading up to Halloween – much of it in the form of Brach’s candy corn, Halloween M&Ms, Reese’s peanut butter cups, Skittles, and so on, filled with BHT, TBHQ, GMO high fructose corn syrup, red 40, yellow 5, and more. As parents, it is our responsibility to stay informed, learn about potentially harmful ingredients, make educated decisions, and say no to our kids as needed. But looking at candy is not enough. Kids dress up and use face and body paints, but the sad fact is that most Halloween face paints, nail polishes, hair colors, and the like are packed with potentially harmful ingredients that are really not needed in order to be effective and fun. While paints and other decorative cosmetics sit only on top of the skin and arguably may have lesser effects on the body than candies, which are ingested, it is still very important to keep the decorative cosmetics non-toxic. Creams and lotions may be absorbed by the skin (which is our biggest organ! ), can get into the bloodstream, and may bioaccumulate over time. It is that build-up and its potential and unknown effect that worry me as a parent the most. This year is the first time that my kids will be dressing up in costumes that will require a fair amount of play makeup and decorative cosmetics, and we will be using the fab products from Klee Naturals! Klee Naturals makes natural play makeup, mineral makeup, water-based nail polish, face paint, and hair and body care products. Most of the products are made in the USA and the rest in Canada. All of the products are natural, meaning that they are free of synthetic ingredients, and are also non-toxic, meaning that they are free of any natural and naturally-derived ingredients that are or may be potentially harmful (and, since there are no synthetics at all, there are no harmful synthetics in them either). The kid-friendly colors are also free from petrochemicals, talc, PEGs, glycols, parabens, FD&C colors, and lake dyes, as well as gluten. For the purposes of this review, we received a box of the Queen Fairy Natural Mineral Play Makeup Kit. The kids are dressing up into lots of pink this Halloween, so the colors in the kit will certainly complement them and the good ingredients will give me peace of mind! The color is a light violet with a nice girly shimmer perfect for any princess, fairy, superhero outfit or beyond! The packaging is smart – there is a little topper on the inside cover to prevent spillage even after opening. 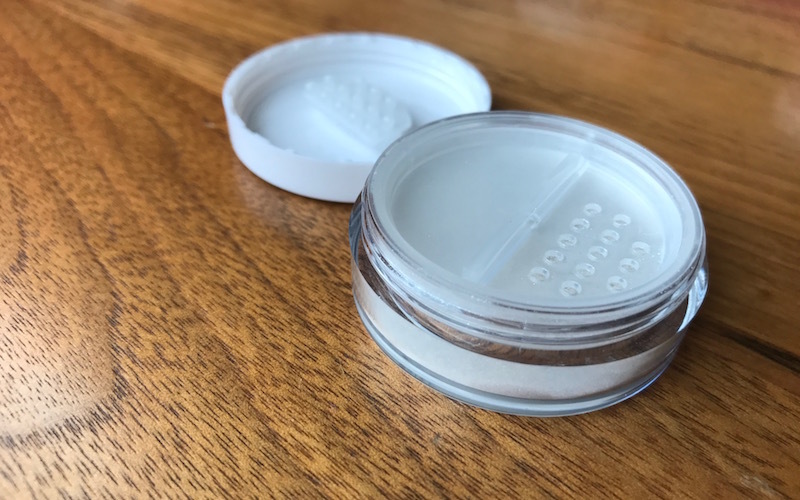 It also comes with the applicator and after shaking a bit onto the lid, it is super easy to apply without a mess. 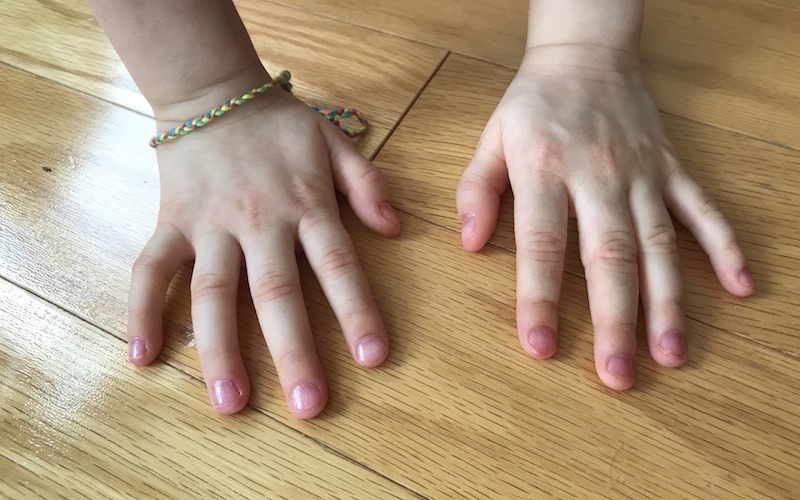 My older one loved applying it herself and you can see the results below of just one light coat (I was not ready to let my 3-year-old get at it by herself…). The ingredients are clean – Mica, Titanium Dioxide, Kaolin Clay, Magnesium Stearate (and may contain Iron Oxides, Manganese Violet, Ultramarine Blues). The mineral blush has the same smart packaging, with the inside topper and secure closure. I love it how it is mess and child-proof, and also easy to apply with both the brush and the applicator (both included). In fact, it works not only as a blush but also as eyeshadow, if the kids want to go for pink. My older one applied the blush easily also, and given that it is a sparkly pink, it was my little one’s favorite to have applied (it goes with her costume too). The ingredients are Mica, Kaolin Clay, Zinc Oxide, Magnesium Stearate (and may contain Iron Oxides, Carmine, Titanium Dioxide). Of all the mineral powders, the body shimmer is lightest in color, making it super versatile for play and costumes – it can work as a body shimmer, eyeshadow, face shimmer, or even as light dusting for the hair if the fairy style so requires (and is also easy to wash out). This product too has the clever packaging and easy application that is truly kid-proof (I’d say kids ages 5 and up for all to apply them well). My 9-year-old will be layering this silvery shimmer with the pink blush as accents on her face (she will be the Cheshire Cat), allowing for style that is not overpowering. The ingredients are Mica, Titanium Dioxide, Kaolin Clay, Zinc Oxide, Magnesium Stearate. Since I let her use it right away and it stayed on for the entire day despite the tons of hand washing, this was my 3-year-olds favorite, hands down. 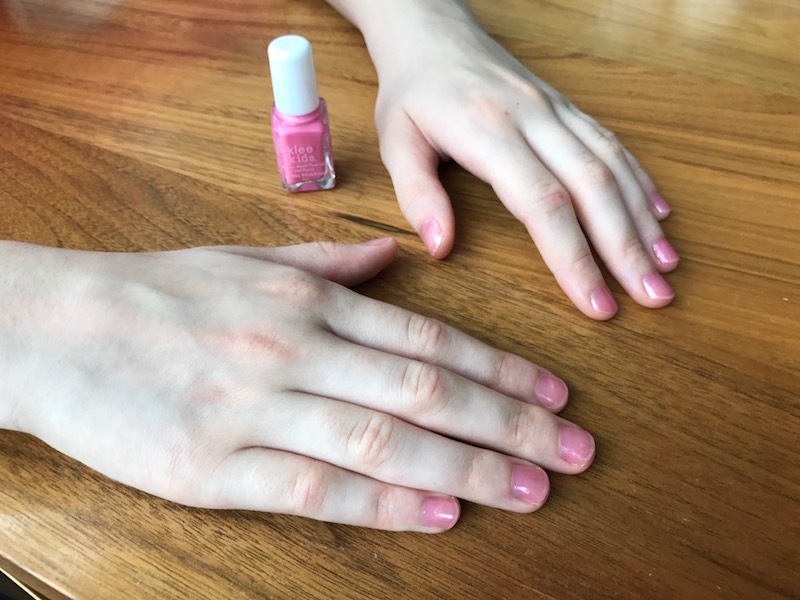 We love the light color that still pops on the nails and goes on smoothly and easily without clumping, pooling, or smearing, or any bad smells. It dries fast too, and comes off easily (in fact, you can just pull it off after a number of hand washes). Older kids can also easily apply by themselves. Also, if it tips over, just clean up with water! The ingredients are Water, Acrylic Copolymer, Mica (and may contain Iron Oxides, Titanium Dioxide and Carmine). 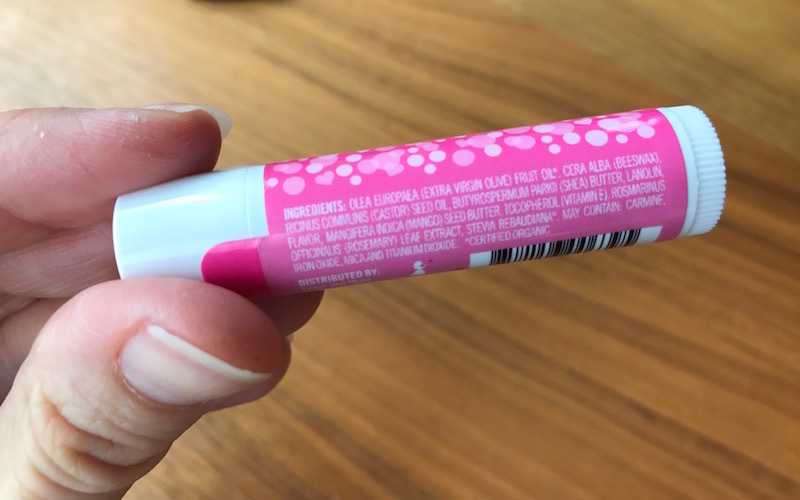 This lip balm has a lovely shimmer that both my kids love. It has a light citrusy scent and flavor but no aftertaste. It is actually versatile enough for older kids to wear on a daily basis (not too noticeable) but after a couple of layers it has a strong enough presence to be perfect for dress up and costumes. Many of the ingredients are certified organic (*) – Extra Virgin Olive Oil*, Beeswax, Castor Oil, Shea Butter, Lanolin, Natural Flavor, Mango Seed Butter, Vitamin E, Rosemary Leaf Extract, Stevia* (and may contain Carmine, Iron Oxides, Mica and Titanium Dioxide). “This smells SOOOO good” were the words out of my older daughter’s mouth when she applied the lotion to her hands and arms. Indeed, the light scent is very nice and not at all perfume-like or overpowering. There are no artificial fragrances in it – it is made with Water, Olive Fruit Oil, Sunflower Seed Oil, Glycerin, Mango Seed Butter, Beta Glucan, Apricot Kernel Oil, Emulsifying Wax NF, Glyceryl Strearate, Organic Argan Kernel Oil, Organic Honey, Organic Jojoba Seed Oil, Xanthan Gum, Organic Calendula Flower Extract, Lavender Oil, Mango Seed Butter, Orange Peel Oil, Lemongrass Oil, Sesame Seed Oil, Naturally Denatured Alcohol, Sodium Itaconate. These are good additions to the kit simply because they make application easy – some kits and sets do not and you either have to use your existing applicators or buy a separate set. 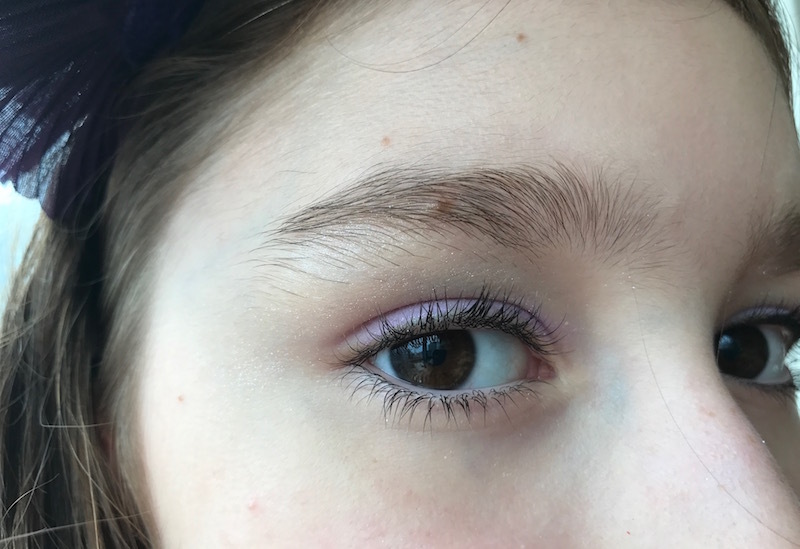 My kids love this kit and, in fact, my older one is asking me to buy the Klee Naturals face paints – she is going to be the Cheshire Cat and is thinking about coloring her entire face and then applying the shimmer and the eyeshadow from the kit we have. Normally I would hesitate, but with these gentle and clean products, I think we can probably make that happen! Furthermore, we are going to a dress up birthday party today and the kit is getting its first official party use too! So, if your kid is going all out for Halloween and getting a game face on or is just playing princess or any other character that requires makeup, do choose something that is safe and non-toxic! With Klee Naturals you know that you are getting clean ingredients and products made in the USA. Stay tuned for follow up pictures from Halloween in a few weeks!